'S e am baile as motha den mhòr-roinn Saskatchewan a tha ann an Saskatoon. Tha e suidhichte ann am meadhan na mòr-roinne air bruach an Abhainn Saskatchewan. Thàinig ainm a' bhaile às a' chànan Cree bhon fhacal "misâskwatômina", ainm airson lus a tha a' fàs anns an sgìre seo. 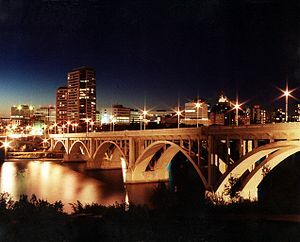 Air sgàth 's gu bheil seachd drochaidean anns a' bhaile, tha far-ainm air cuideachd: "Bridge City"
Air a tharraing à "https://gd.wikipedia.org/w/index.php?title=Saskatoon&oldid=426823"
Chaidh an duilleag seo a dheasachadh 9 dhen Mhàrt 2013 aig 05:58 turas mu dheireadh.